The role of the liver is crucial for our health, but unfortunately, liver disease rates are on the rise over the years and have become the fifth most common cause of death, and the second leading cause of mortality amongst all digestive diseases in the US. The liver, one of the largest and hardest-working organs in the body, is believed to be of the “wood element” and is crucial for the transformation of food into energy, or qi. Liver damage can be a result of heredity, prolonged exposure to toxins, and long-term liver diseases, such as cirrhosis. A “stabbing” or “throbbing” pain in the abdominal area is another early sign of liver damage. This issue can often be relieved only through proper treatment of the underlying issue. 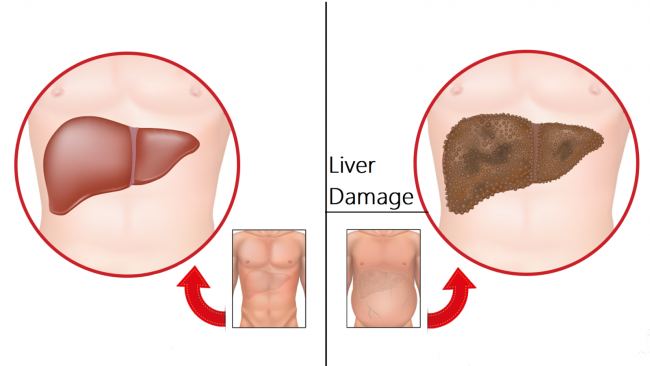 Liver damage disrupts the normal blood flow to the organ, increasing the pressure in the surrounding veins, including the ones responsible for transporting blood from the spleen and intestines to the liver. This, in turn, leads to higher blood pressure levels or a condition known as portal hypertension. It results in the accumulation of fluid around the abdomen, called ascites. A damaged liver cannot adequately expel toxins from the body, leading to sudden changes in normal digestion and metabolism. These changes cause numerous digestive problems, including nausea and vomiting. Researchers have found that liver damage leads to chronic fatigue and exhaustion, which are believed to be a byproduct of neurochemical changes in the brain and hormonal imbalances. Their symptoms are aggravated by the high levels of toxic byproducts in the blood, as the impaired liver cannot properly remove. The liver produces necessary protein enzymes, and an impaired liver leads to a damaged blood-clotting mechanism, that can lead to changes to the skin’s appearance. Liver problems often lead to discoloration of the eyes and skin, due to the accumulation of a bile pigment called bilirubin, which cannot be properly eliminated. Jaundice is characterized by yellowish hueing of the skin or eyes, and also leads to symptoms such as itchiness in the entire body, darkening of the urine, and cognitive impairment. A damaged liver cannot supply fluids within the body properly, so the skin becomes dry, irritated, and you might even experience reddening of the hands or feet, yellowing of the mucous membranes, or inexplicable spotting. Fortunately, the liver is very adaptive and if treated, it can heal itself. Most liver-related diseases receive a positive diagnosis if controlled and guided by a medical professional. Therefore, in case you experience these symptoms, consult a medical professional, in order to determine the underlying cause and treat the issue on time.